Whether you're cooking for a crowd or having an intimate Thanksgiving meal, here are seven incredible soups to make ahead of time. 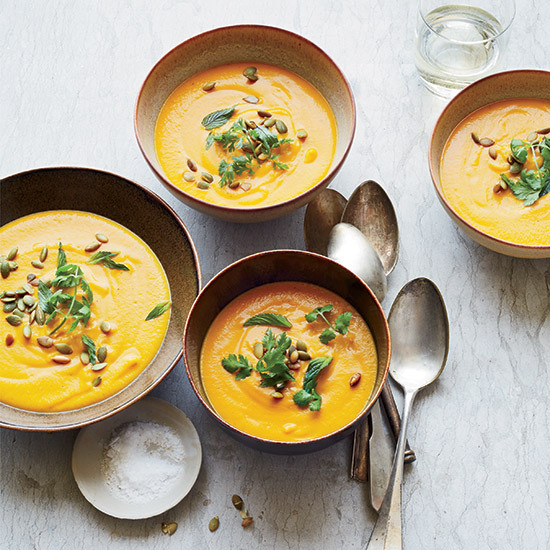 What's the secret to this luscious carrot soup? Gingersnap cookies. Canned chipotle chiles in adobo sauce give this soup its terrific, smoky flavor. Mario Batali's hearty soup features a colorful mix of carrots, peas, leek and onion. Serve this fantastic soup with herb salad and Dijon-roasted cauliflower. Ceylon tea flavors this silky, creamy soup. This healthy vegetarian soup pairs well with a full-bodied California white. Beets, turnips and parsnips star in this delicious soup.